Earth Matters: it's our life support system. We share it with a growing global population and millions of other species. We depend on the Earth's resources for the goods and services that sustain us: for the food we eat, the clothes we wear, the materials we build our homes with. Nature underpins our wellbeing and our prosperity. It's time to reconnect with nature, to deliver goods and services in a sustainable way. We are a key part of the global ecosystem. We have a duty to look after our planet. We must look after it in order to face the challenges of the 21st Century. By taking a new approach to the way we do business - looking beyond profit to purpose - there are exciting opportunities ahead, to generate environmental, social and economic benefits. Earth Matters exists in order to start conversations and build partnerships that bring about positive outcomes for society and the environment. We're also looking to have fun on that journey. We know that silos need to be broken down, conversations need to be started and new partnerships need to be built. We look to a future where business and sustainability go hand-in-hand, where purpose is embedded in the corporate DNA of every business - generating profits alongside net benefits for society and the environment. The window of opportunity is here, now. Let's seize it! Our objective is to build partnerships between business and the wider community, to work in partnership to deliver shared value. As a Community Interest Company, Earth Matters exists to create lasting environmental and social benefits from projects we design and deliver. What do you make or offer? What need does it fill? Why does that need exist in the first place? What costs are built into how you cost the product or service? Why do customers buy from you? What are their key purchasing criteria? What is important in a new product or service? How is the market analysed and demand predicted? Does your business have an executive culture that is willing to make tough decisions when necessary? What manufacturing processes are involved? What capacity do you have? How efficient are your processes, and what limitations exist? What are your most critical sources of revenue and profit? Which direct and indirect cost drivers have the largest impact? Why are certain suppliers used? What are your key buying criteria? Who are your most important audiences for external communications? Why do your employees choose to work for you? What is important to them? Is your business seeking to attract certain groups of investors? Our projects are about creating shared value, for business, the community, and wider society. Delivering environmental and social benefit alongside profit. Earth Matters is working alongside the Peterborough Environment City Trust to introduce a Refill & Reuse scheme to our city. 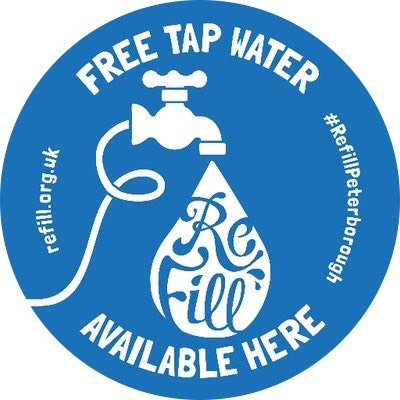 Refill Peterborough builds on similar schemes elsewhere across the UK - Bristol, Norwich, Brighton, Hunstanton, Bath, Durham & the North East, Dumfries & Galloway, Cornwall, Devon, Dorset - and aims to reduce our reliance on single-use plastic water bottles by offering consumers the opportunity to refill their bottles, for free, at Refill Stations across the city. 1 million plastic bottles are brought around the world, every minute! 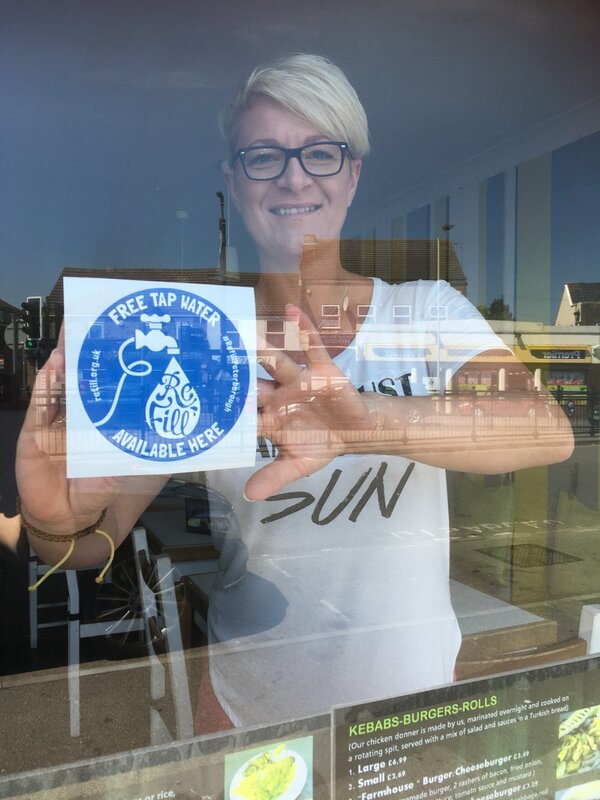 Download the Refill App to help you locate the nearest Refill Station, which can be easily identified by an accompanying photograph and characteristic 'water-drop' window sticker. There are now more than 1,600 Refill Stations across the country, and a growing community of users, both young and old! Some of the fantastic people who have joined the Refill Peterborough community. We love you all! Operating a points reward system, consumers can have their plastic bottle replaced with a sustainable stainless steel alternative. 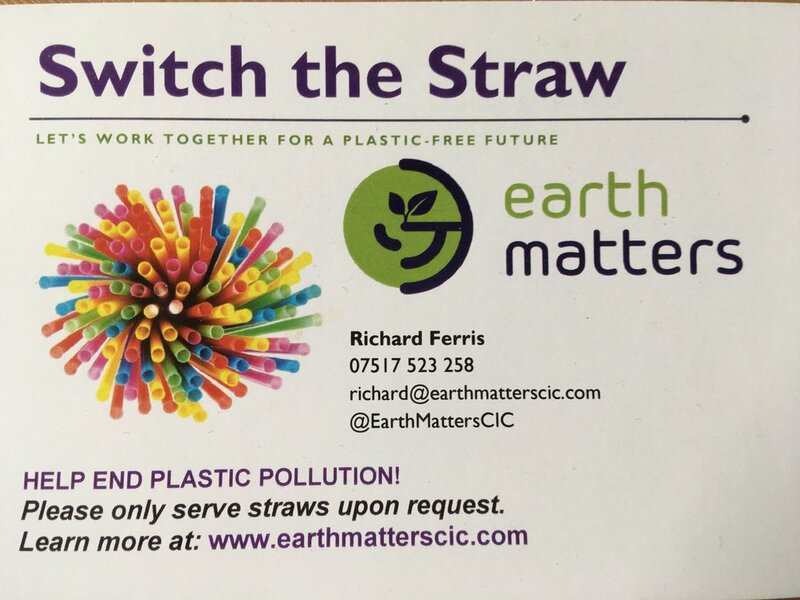 Earth Matters is working with local businesses - cafes, coffee shops, restaurants, pubs - to help them make the switch away from plastic straws to biodegradable, paper-based alternatives. This is not good! All plastic breaks down into smaller and smaller particles known as micro-plastics. In other words, they don’t ever biodegrade, as such, which only natural materials can do, like paper; this causes a huge problem as they are then eaten by marine organisms and birds. 50% of these die as a result. 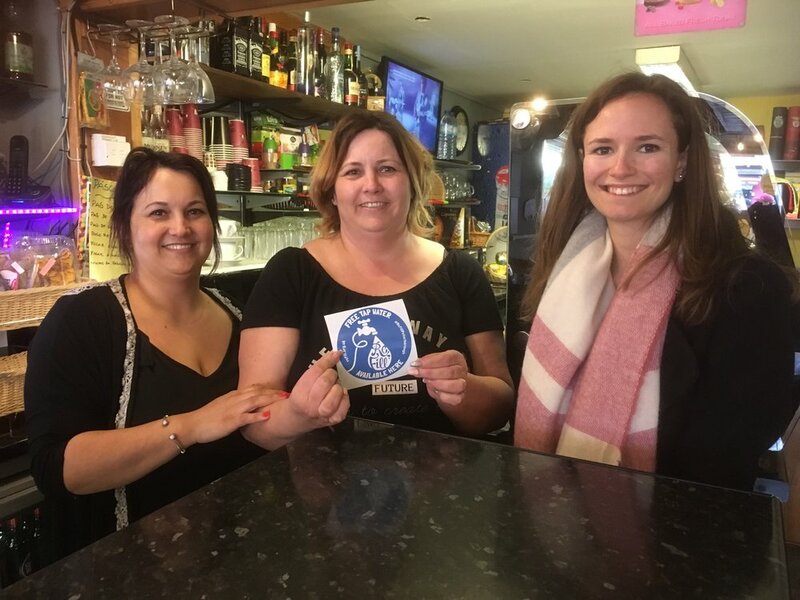 Our campaign aims to engage businesses to (1) stop serving drinks with plastic straws, and - if they must use straws - (2) switch to paper-based biodegradable alternatives. Identifying reliable suppliers who can provide paper straws at a competitive price, means that we can support businesses to move to a more sustainable way of serving your drinks! However, we need to be conscious that biodegradable plastic straws may not break down in the oceans, as the sea is often too cold. Doing without really is the best option, unless consumers and businesses are prepared to invest in single-use paper straws or buy their own bamboo/ stainless steel /glass reusable straws. We are exploring opportunities for businesses to work with the health and voluntary sector, to provide opportunities for people to get involved with nature activities; offering them a chance to make new friends and do some physical activity, in surroundings that can help to rebuild confidence and a sense of wellbeing. Nature benefits, too! Just like a bank account, we can't go overdrawn on nature. All of our actions have consequences, and current lifestyles are undermining the natural world around us. We are committed to working with nature, to ensure that business is conducted in a manner that generates positive outcomes. Restoring habitats, particularly where people live, builds resilient wildlife and communities. We're looking to build new nature experiences in urban settings where green space is in short supply. The Benefits of Nature - Our Natural Assets - Natural Capital Explained What does nature mean to you? People talk about 'natural capital' - how our natural environment is an asset that we use to deliver goods and services like food, drinking water, flood mitigation and recreation. In a complex, inter-related world, business needs to embrace new ways of working, to create lasting benefits for people and planet. Most of all, we've had a lot of fun along the way! For too long there has been a stand-off, an 'us and them' attitude between business and the environment sector. It's time to break down barriers, to work together, using the common language of sustainability. Together, we can seize the opportunities to create shared value.